I suspect that if I lived in Vancouver consciousness wouldn’t have a glimmer of a hope at this time in the morning. Apparently Canada rocked the Olympics or something. 14 Gold Medals, breaking the previous record of 10. Mocking our technical difficulties from the opening ceremonies at the closing of the games. That’s a country I am proud to belong to. The Olympics were a great chance to highlight the diverse culture and cuisine we have up here in the north (or east or west depending on where you are at). With the games finished the impact of all the great publicity will continue to benefit us Canucks for quite some time. That gold medal record doesn’t hurt either. 14 Gold Medals! 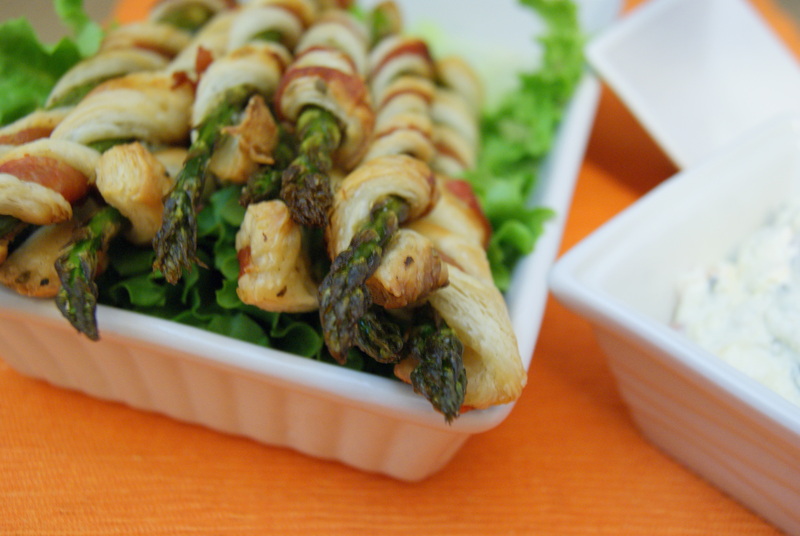 With all of the opening and closing ceremony parties so soon after the Super Bowl you might be finding your go to list of appetizers exhausted. 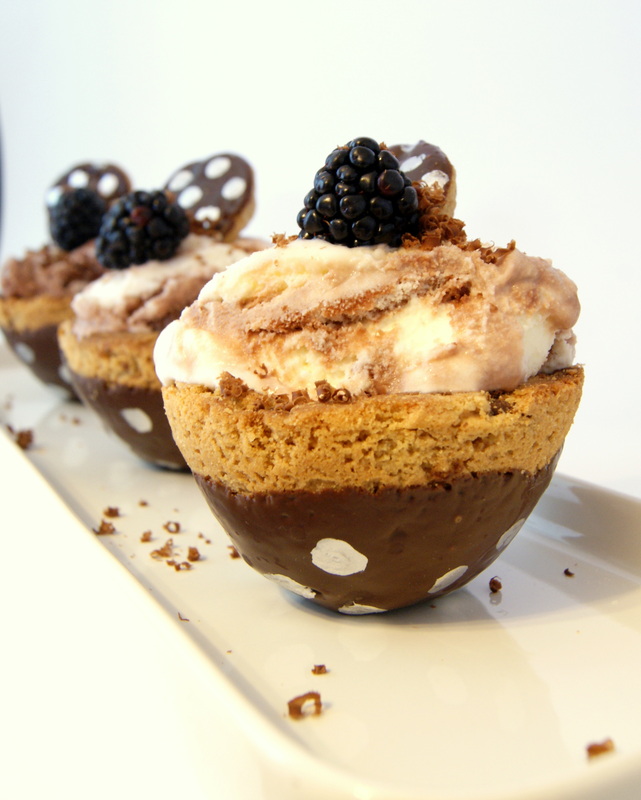 Here’s a crowd pleaser with a pretty little twist. Bend one spear of asparagus until it snaps. Trim the rest of the spears at the same point. Wash.
Toll asparagus in olive oil, oregano, garlic salt, and pepper. Roll out the puff pastry 1/4 inch thick between two sheets of parchment paper. Cut into thin strips about the same width as the asparagus spears. Wrap each strip of puff pastry tightly around a spear. Slice prosciutto into strips a bit thinner than the puff pastry. 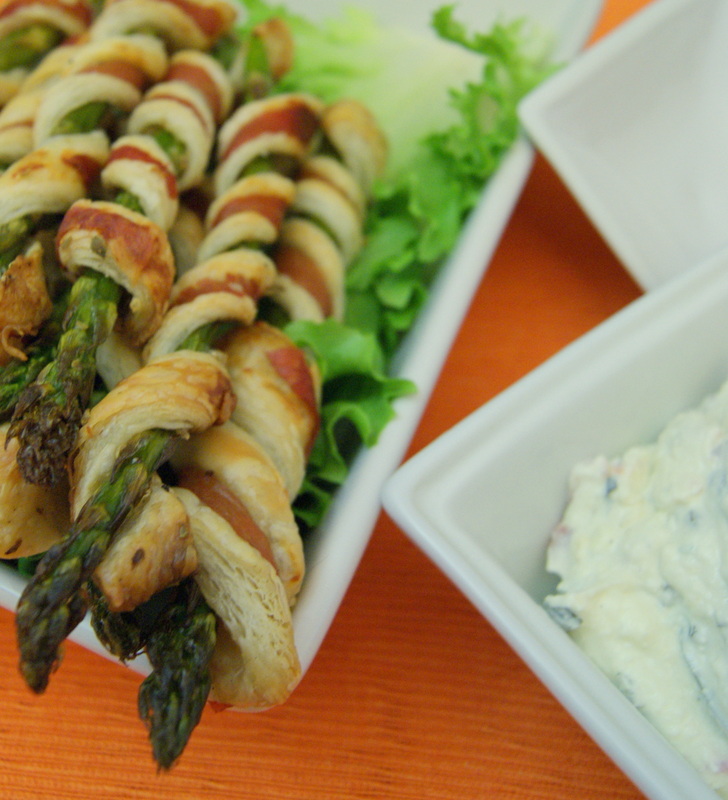 Wrap each strip around the asparagus, directly ontop of the puff pastry. Place on a baking sheet lined with parchment paper. I like to chill mine for 5-10 minutes in the refrigerator, I find it helps to hold the shape. Bake for approx. 25 minutes until the edges are golden brown. Serve immediately alone or with dip. I served these with a basil tomato dip. I quickly heated up some plain yogurt and set it in a fine mesh strainer to allow the water to drip off. I mixed the now thickened yogurt with melted cream cheese, fresh basil, minced garlic, finely diced tomatoes, and salt and pepper. The tang from the yogurt was perfect for the buttery puff pastry, while the cream cheese toned it down enough to enjoy the other flavors. I finally managed to get a picture accepted by Taste Spotting. I had submitted a whole three… I mean it was definitely about time that they acknowledge the greatness that is me. I danced a small victory jig and promptly forced my husband to stare in reverence at the screen where my Cookies and Cream for Grown Ups sat side by side the amazing pictures that grace Taste Spotting. Little did I know the best was yet to come. I walked away with a smile plastered across my face. Even the rejection from Food Gawker (for the same picture and post) couldn`t get me down. I had managed to get on the pages of Taste Spotting. I knew it was a good thing. I wasn`t really sure why, but the spike on my traffic chart a few hours later confirmed it. I`m too embarrassed to even tell you what my previous high number was (or how excited it had made me). But I will tell you that Taste Spotting brought in a couple of hundred people to my humble little blog in one day. Well 339 to be exact. You know, in case you NEEDED that information. I`m sure that everyone out there that`s been in the blogsphere for any length of time is humoring me with a virtual pat on the head right now. I know it`s nothing more than a small drop in the big ocean of food blog traffic, but it`s my small drop! I will call him squishy and he shall be my squishy. For a little while (most of the night) I sat in front the laptop hitting the refresh button on my stats page as faithfully as Desmond down in the Hatch punching in those fateful numbers. The only thing that managed to drag me away, and install some sort of sanity, was the smell of the Chicken Stew warming on the stove. The call of the stove siren brought me back to what started this blog experience in the first place; my love (ahem…obsession) with food. Things like stews and soups aren’t really meant to be made by strict recipes. The beauty of this kind of naive cooking is in the simplicity of the ingredients and the straightforward methods of preparing them. The recipe I’m going to set out for is only a guideline, make it your own. Change the amounts, change the ingredients. The only two things that I really recommend you don’t meddle with is browning the chicken and cooking in a slow low heat. Chop onions, celery, carrots, potatoes and herbs. In a large oven safe pot (dutch ovens are ideal) heat up a bit of vegetable oil and saute the onions untill soft, add garlic and cook for a minute. Add celery and carrots, allow to sweat on medium heat. In a large frying pan heat up 1/3 cup of oil on medium-high heat. Brown both sides of the chicken legs in the oil. Each side will take about 6-8 minutes. You want to make sure you get a really deep brown colouring. Keep the pan on the heat. 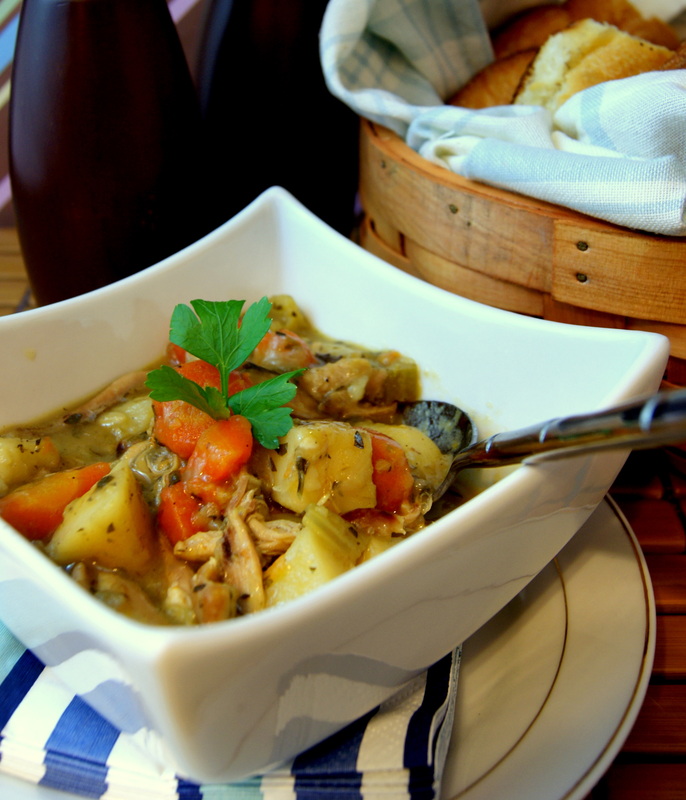 Add chicken to the pot of vegetables along with potatoes, thyme, and bay leaf. Add stock to just cover the chicken and vegetables. Add flour to the hot oil in the pan the chicken was browned in. Stir immediately and continue to do so for a minute or until the flour turns light brown. Add to the pot, mixing to incorporate. Place in for 40 minutes to 1 hour. When the chicken meat is falling off the bone remove it from the pot and shred the meat. Return the meat to the pot. Check the vegetables, a fork should go through them easily. If not return to the oven. When they are ready add the frozen corn and parsley. Stir to combine. Remove Bay Leaf. Season with the Salt and Pepper to taste. Allow it to cool a little and enjoy or refrigerate over night. Stews are always better the next day when the flavors have had a chance to mingle. Hopefully by the time t.e.b (titillating eatables blog) reaches it’s 1 month-a-versary on the 6th of March I’ll be able to break into the still formidable Food Gawker! I’ve got my eyes on you Mr. Gawker. My husband loves cookies. I don’t. When I make food (especially if I’m baking) my creativity starts to itch and I want to do stuff…something..anything to the goods I’m creating. The scoop and bake nature of most cookies doesn’t really do it for me. Unfortunately my husband loves cookies. And I love him. So I finally went about making him some mind numbing chocolate chip cookies. I picked up the recipe from Amanda at Fake Ginger. And I’ve got to admit, although I’m not a big fan of cookies I ate more than I should have of these. They live up to the name of Best, Big, Fat, Chewy, chocolate Chip Cookie. My husband actually managed to polish off the first batch and I had to make a double batch the next day so that I’d have some to freeze. Molding the cookie dough into the pan was easy enough, you just have to be sure to press the dough against the walls of the pan until it is a thin layer. It’ll expand a lot when it bakes. I put a little extra dough in the bottom for reinforcement. I baked them off at 325f. After about 10 minutes I took them out of the oven and pressed the dough back against the walls of the pan with a spoon. After about another 5-10 minutes, when I could see the outside of the chocolate chip bowls were nice and golden brown, I took them out of the oven, pressed the inside back down, and turned the oven to broil. I placed them under the broiler for a few minutes to firm up the inside of the bowls (watch closely) and them let them cool. Now you could use these just as they are. Or if you are like me you could take it a step or two further and add some decorations. I evened out the tops of the bowls with a microplaner and dipped each bowl in dark couverture chocolate. They were then decorated with edible silver paint. The little chocolate circles you see on the top are actually miniature chocolate chip cookies. I dipped the backs in the dark chocolate and painted matching silver pokadots. To make sure they sit flat on the plate take a microplane to the chocolate covered bowls and gently even out the bottoms (save the shavings for decoration). Fill with your favorite ice cream add a berry or two and you’ve got yourself all of the fun of cookies and cream with a little extra grown up indulgence. The beauty of these is that as the ice cream melts it soaks into the bowls and it’s amazingly delicious. Reminisent of milk dunked cookies, with none of the dripping fingers. Nooooo!!! (can you hear the anguish in my scream?). I had almost completely finished a post and it somehow disappeared into the vast depths of cyber space. Pen and Paper would NEVER do this to me. NEVER. But my blog knows that I could never leave… It’s got ahold of me. WHAT??!! It just auto-saved a draft of this post, 30 seconds in. Why didn’ t it do that for my almost finished post? I swear blog if you keep jerking me around like this I will forget your fancy templates and convenient world wide distribution… (I think it knows that I’m bluffing). So my first attempt at this post had some witty remarks about food trends and stuff. I don’t feel like (there it goes, auto saving again… how kind of it) re-writing it. I feel like being stubborn and giving the middle finger to my screen. Not that that’s going to get me anywhere. 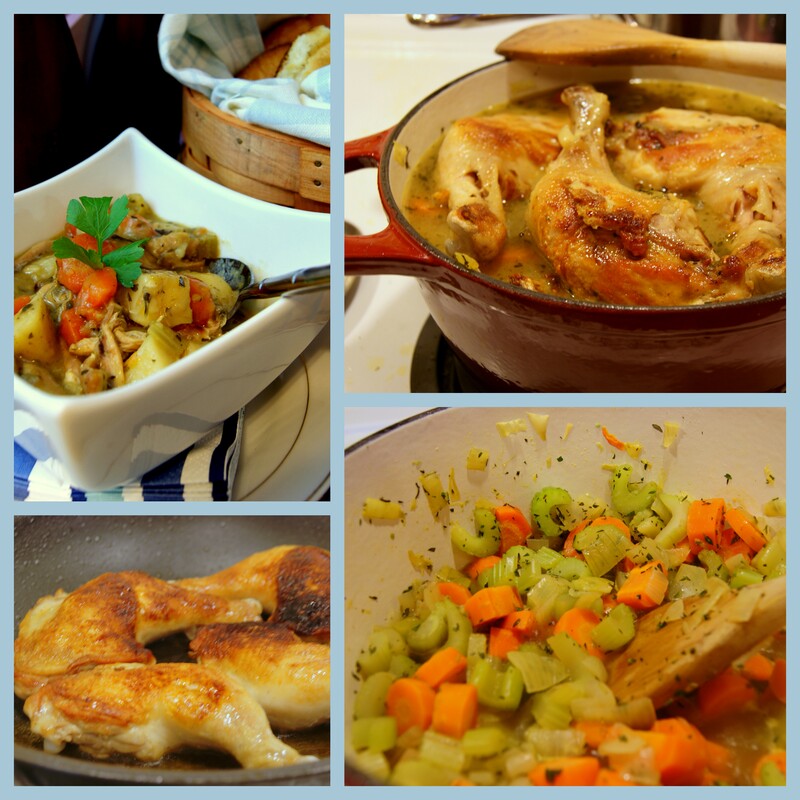 To sum up what I said before: food in 2010 is all about soups, stews and casseroles. Some call this rustic cooking. Some call it home cooking. I’m going to call it naive cooking. In a good way. na-ive [nah-eev]: 1. having or showing unaffected simplicity of nature or absence of artificiality; unsophisticated; ingenuous. This is as far from seared foie gras on a bed of watercress with a sprinkling of truffle oil as you can get. This is food lounging in well-worn jeans and a hoodie. It doesn’t need to gussy up to impress because it knows that it’s got it going on just how it is. Now I don’t want you to think that I’ve got something against fancy food. My culinary education is in classic french cuisine. You don’t get any more pretencious than that, trust me. It’s got a time and place. But that place isn’t here and that time isn’t now. Awhile ago (years) I picked up a book that was filled with exactly these kinds of recipe. Home Baking by Jeffrey Alford and Naomi Duguid is filled with recipes they uncovered in everyday kitchens all around the world. It’s a hard covered textbook sized book and it scares me. There aren’t many pictures and most of the ones that are present showcase the unique locals from the towns and cities the recipes were picked up in. 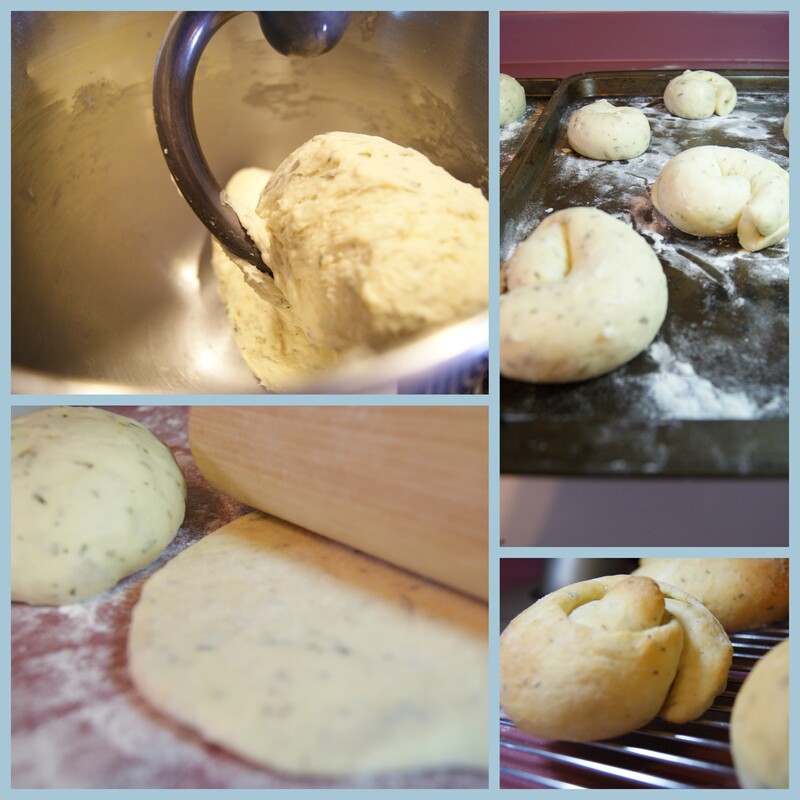 I like pictures showing the process of a recipe, they give me courage. So I called myself out for being afraid, there were some mean names used, and then sat down to flip through the pages. These book is so much more than just recipes. It’s full of stories behind the travels and discoveries that brought the book into reality. There’s a section devoted to the rhythm of home bread baking. There’s even a little statement about mistakes: encouraged and natural, almost necessary. My kind of book. 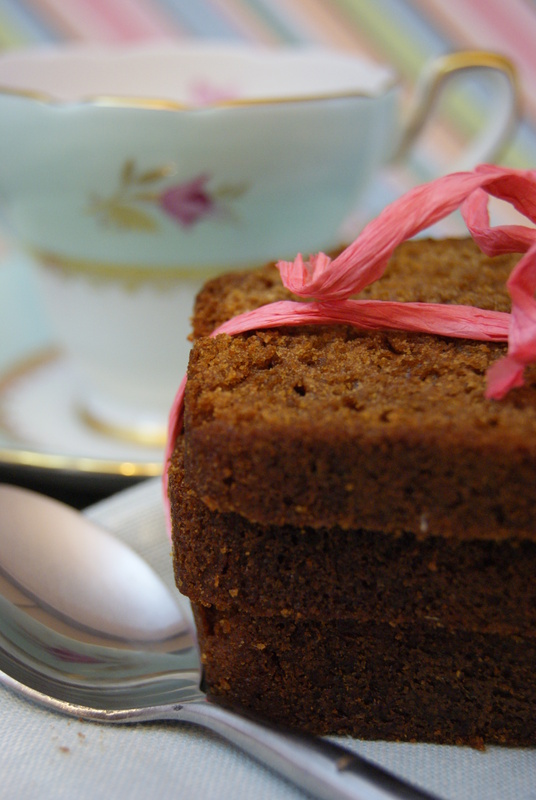 I eyes settled on a Ukrainian Honey Cake recipe (no picture) and I got to work. 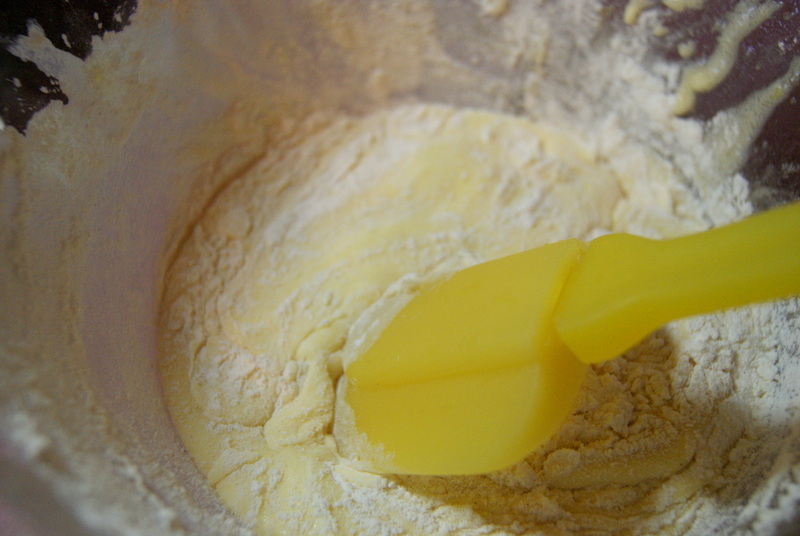 Using a mixer, or working by hand, beat the egg yolks and sugar until pale and smooth. Add the honey and melted butter and mix until blended and smooth. Sift the dry ingredients into a bowl. Add half the dry ingredients to the egg mixture and stir in. Stir in the coffee, then stir in the remaining dry ingredients. Beat the egg whites until soft peaks form. Fold them into the batter, then stir gently several times. The batter will be quite wet. Pour the batter into the prepared pan and bake for 1 hour, or until a skewer inserted into the center comes out clean. Let cool for 10 minutes, then remove from the pan and place on a rack to cool completely before slicing. Eat plain or buttered, with hot tea or coffee. 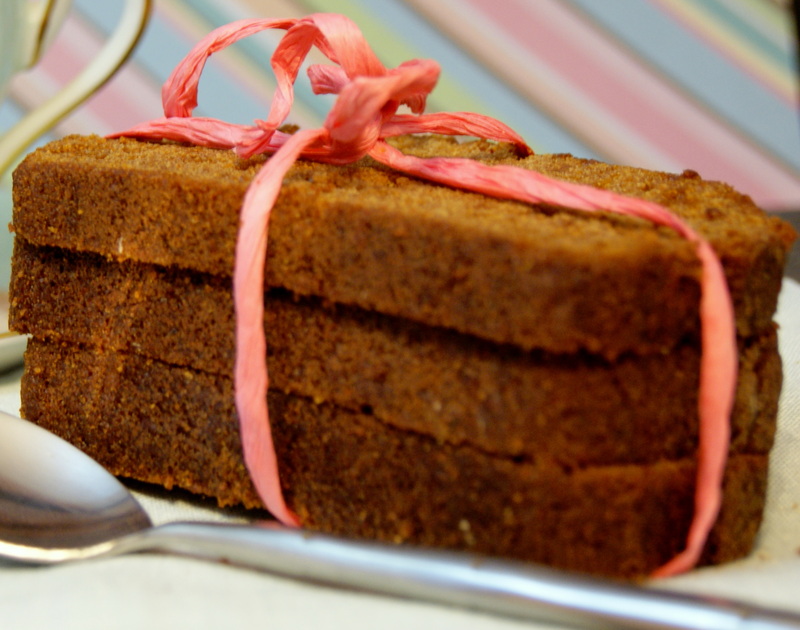 The authors point out that nuts, raisins and even more complex spices can be added to the cake. I’m excited to try out different varieties. I think adding in another texture would be a great addition. Bubbles of Escaping Carbon Dioxide- bye bye leavening action. So speaking of mistakes I managed to turn my oven off without really realizing it (that whole auto pilot thing). I placed my batter into my still hot oven (from some previous baking) and walked away. Twenty minutes later I realized what I had done. Plenty of time for all the carbon dioxide the baking soda had created to completely escape. That being said the cake still turned out fairly light. We can thank the egg whites for that. It’s always good to have a lesson in why we should respect baking soda. I’m lazy. Well maybe not lazy so much as energy efficient. That’s sounds much nicer, almost eco friendly. The problem is that I also like to make individual desserts that make everyone ohhh and ahhh. Usually that involves packing idity bidty tart tins with a shortbread or pie crust. Some days I’m up for that. Most days it’s as likely to happen as an episode of Lost is likely to end without a ‘WHAAAT?? ?’ moment. In solution to this great conundrum I bring you: Fancied Up Lemon Bars. They are technically Lemon Coconut bars, but that was just too much of a mouth full. Actually technically they would be Lemon Coconut Bars with Raspberry Compote and Chantilly Cream. You can see why I went with Fancied Up Lemon Bars. These are as simple as making a batch of lemon bars and taking a cookie cutter to them. Add a few accessories and you’ve got yourself a ohhh and ahhh worthy dessert. The recipes for the bars came from Jen at Food & Whine. She’s a fellow Canuck Food Blogger (yes all of those words are capital worthy) and also hails from Ontario. For any other Ontarioins (that can’t be right) you’ll appreciate the great whit behind the name of her blog. Food & Wine is a hugely popular magazine put out by the official booze store here in Ontario (L.C.B.O). I did adjust the recipe a bit to flow better with the accessories we will be adding. Crust: Preheat oven to 350° F. You can line a 9 x13 inch pan with parchment paper. I didn’t (energy efficient remember?) but it did stick a little on the corners. Toast coconut. It should take about 7 mins, watch it closely. Put aside to cool. Put the oven to 325° F.
Beat butter and sugar until light and fluffy. Add vanilla. Stir in coconut, flour and salt until crumbly. Do not overmix. 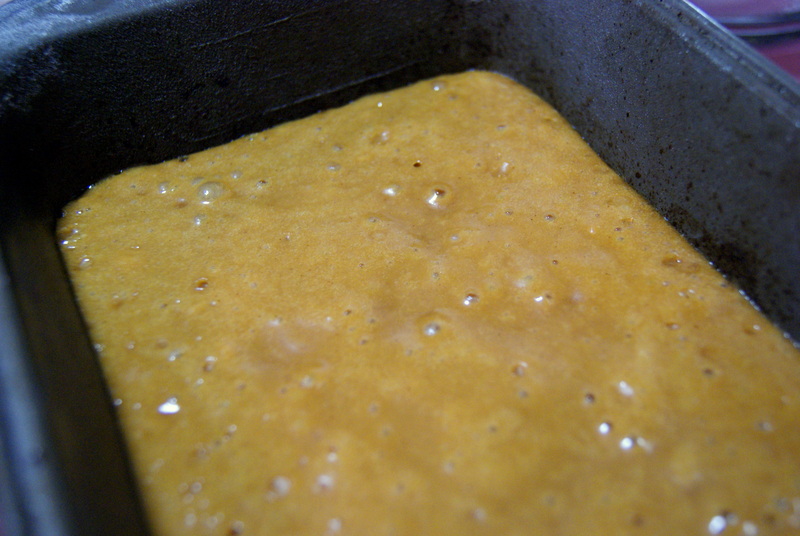 Press into the bottom of the pan..
Bake for 20 minutes, or until firm and golden around the edges. Let cool completely. 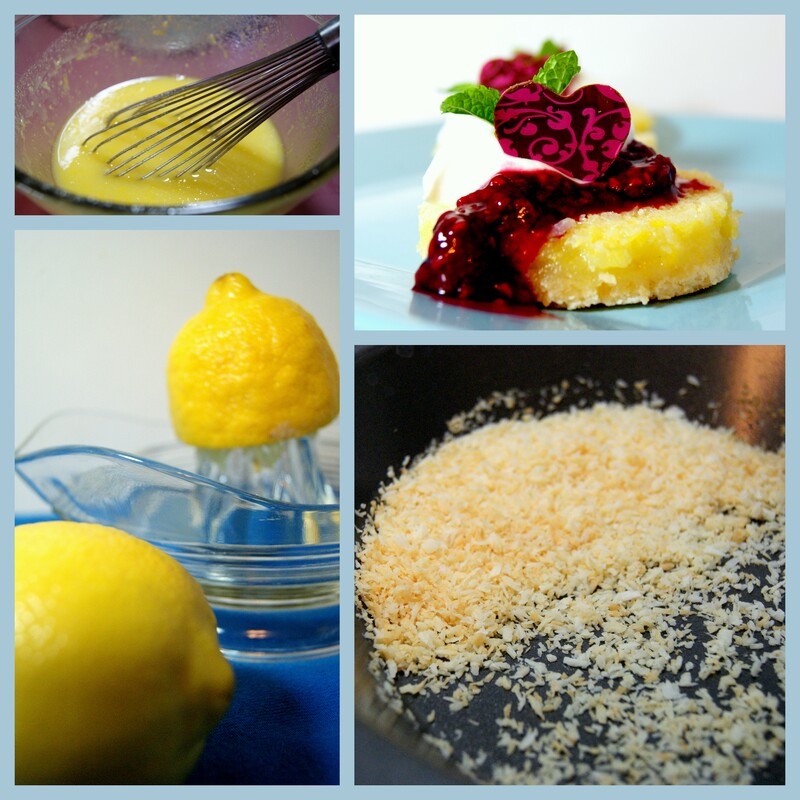 Topping: Whisk together the eggs, sugar, flour, lemon zest, lemon juice and vanilla until blended but not foamy. Pour over cooled crust and sprinkle with coconut. Bake until topping is golden and puffed at the edges and just set in the centre. About 30 mins. Let cool for about 10 mins. While still slightly warm to the touch take a 3 inch circle cookie cutter and press down firmly. Cut out as many as you can, or as many as you need. Save the scraps for munching. I love the flavor combination of lemon and raspberry and I knew raspberry would get along well with coconut. You could use strawberry if your not a fan. 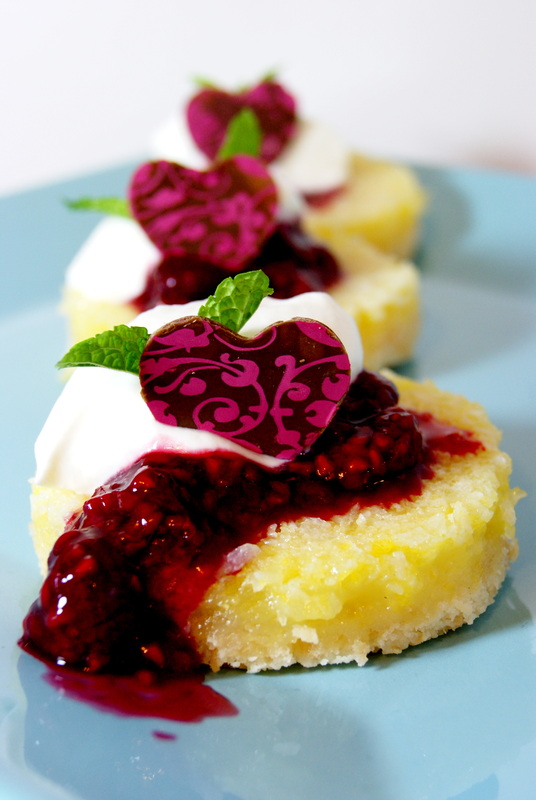 The Chantilly Cream adds a sweet richness to balance out the tarty lemon and raspberry. Mix the corn starch into the cold water, combine fully. Place 1 cup of raspberries in a small pot. Add cornstarch mixture, sugar and vanilla. Place over medium-high heat. Let the berries come to a boil and cook for a few minutes. Take off the heat and add in the 1/2 cup of raspberries. Stir together. Allow to cool. Beat goether until soft peaks form. To assemble our darling little desserts simply spoon some Raspberry compote on top of the lemon bar circles (is that an oxymoron?) and place a dallop of Chantilly Cream on top. You can garnish with some mint leaves and even a little chocolate decoration. Serve to your guests, sit back and wait for the ohhing and ahhing to start. See? Very energy efficient. Got any ideas on how to dress up other simple desserts? Any tips or tricks on making individual desserts and saving some of the hassle? Remember what Moma said: Play nice and share! 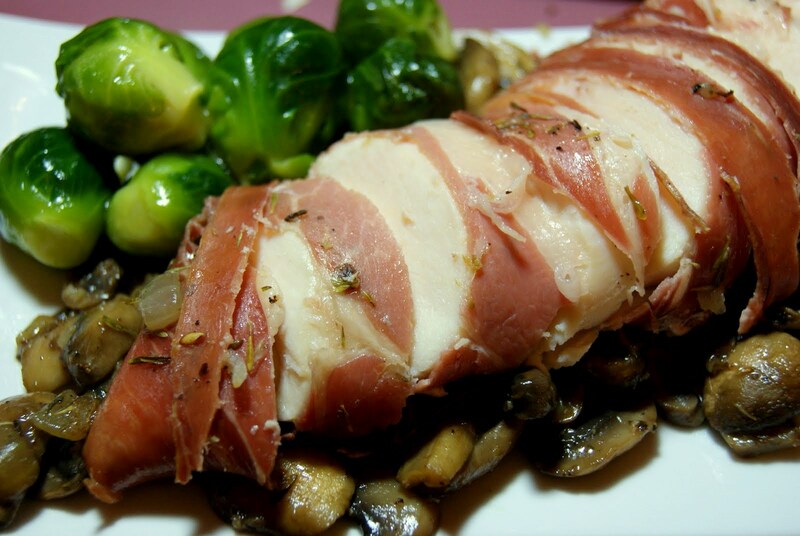 For awhile now I’ve been craving chicken wrapped ever so indulgently in thin slices of prosciutto. It might have something to do with the fact that I choose a picture of that very same dish to grace the top of the blog. unfortunately I have a slew of other meals planned for (and shopped for) that I need to consider first. But! That doesn’t mean that YOU can’t enjoy this amazing little number for me. Place everything in a pot and top up with water. You want to have at least 2 cups of water. Heat on the stove until the salt has dissolved. Put aside to cool. Add ice cubes and water to bring up to at least 5 cups of liquid. Place the chicken in the brine for a few hours. Drain the liquid off and reserve the chicken, onions, garlic, thyme and peppercorns. Add a ¼ cup apple cider vinegar and ¼ cup olive oil. Mix all well and refrigerate overnight. Package of good quality prosciutto. Lay out slices of prosciutto so that they over lap slightly. Lay chicken breast on top and wrap it with the ham. Place in a baking dish and place in the oven. Sweat off the onions and garlic. Take the chicken out of the oven. Pour the mushroom mixture over the chicken in the oven, making sure to baste the prosciutto thoroughly. The chicken should take between 20-25 minutes to cook. Check on it periodically and continue to baste the breasts with the liquid from the stock and mushrooms. When the chicken is cooked remove it from the oven and place it on a plate to rest. Pour everything else from the pan into a frying pan and reduce until the stock is nearly all gone. Spoon the mushrooms on the plate first and lay the sliced chicken breast on top. I think that I might make this with some gnocchi when I do get around to making this again. Maybe with a nice sage brown butter. If you end up making this be sure to let me know so I can enjoy it vicariously through you. I’m beginning to realize more and more just how small this blogsphere really is. The other week almost every other food blog I visited had some mention of Blog Aid: Recipes for Haiti. As I came to learn it is an amazing effort from some food bloggers to put together a cookbook to sell and raise funds to help relieve some of the effects from the disaster in Haiti. I was awed by such a great show of compassion and action. All of the blogs pointed to Julie from Dinner with Julie as the person who had spearheaded the whole project. Not that long after I was continuing my never ending search for Canadian presence in the online food blog world and stumbled upon Cuisine Canada Scene and they were doing a feature on none other than Ms.Julie! I was chucked to bits to find out that such an admirable woman was a fellow Canuk. One link lead to another and I found myself on Julie’s blog and gawking at the most incredible looking buns. There’s a great story behind the post, which includes making home made lard. Check it out, after you’re done here of course. I keep intending to have a go at some of the recipes from the many cookbooks I have sitting on my shelves. 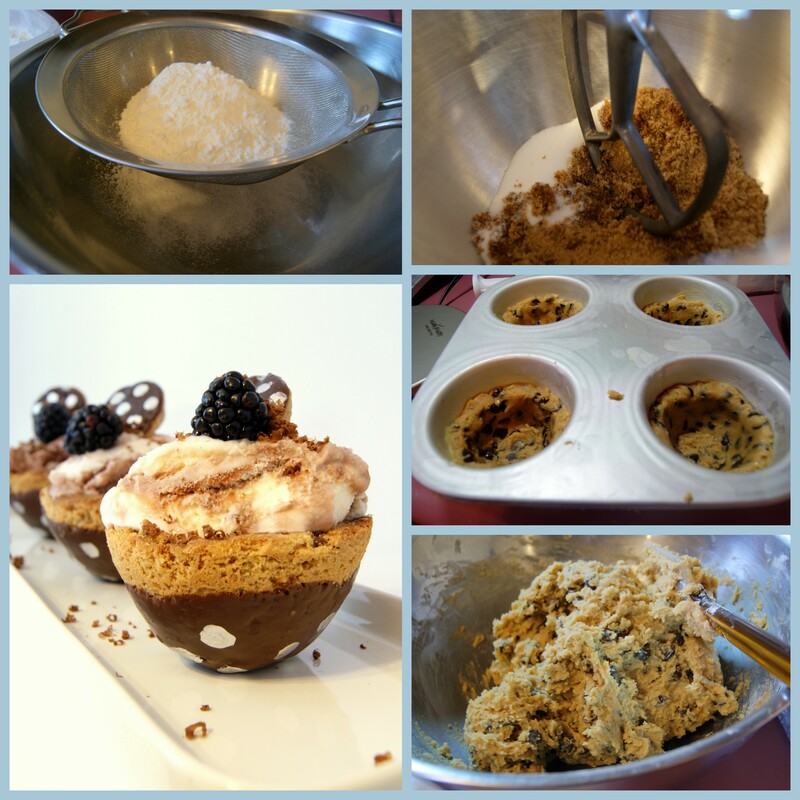 But it seems that my attention keeps getting diverted by recipes posted by fellow bloggers. Does anyone else have this problem? Posts from t.e.b voted most likely to entertain and inform you. Love t.e.b? Get the RSS feed here.